While browsing the library used book room, I came across a Homelife magazine from March 2017. I remembered these magazines from my childhood in the Southern Baptist church. I always enjoyed reading the stories once my mother had finished reading the copy we received at church every month. Home Life has changed a lot in 40 years....it is much more fashionable in look and content. They even have recipes now. I found this recipe for Pecan Pound Cake and I knew I had to try it. It was so tasty. I took a portion of the cake to Chatsworth for our Thursday night family dinner. I also cut up some pieces and froze them for dessert at a later date. I have to say I think this might be my new favorite pound cake recipe. Combine sugar, butter and shortening in bowl of electric mixer. Beat until creamy. Combine baking soda and all purpose flour. Add one cup at a time beating after each cup. Mix until creamy..fold in pecans. Spoon into greased and floured tube pan. Bake one hour and 15 minutes. Let cake cool in pan before turning it out onto cake plate. I did take about 1/4 cup of flour and mixed it with my pecans ...this helps to prevent the pecans from falling to the bottom as the cake bakes. Enjoy! This recipe is a keeper. This is almost the same as my recipe. Slightly different and people rave over it. Pecans would be a great idea. Going to have to add them next time. Oh and I remember Homelife as well. This looks delicious! My first published article years ago was for Home Life Magazine! The cake looks (and sounds) delicious! Thanks for sharing! Can you believe that we don't like pecans? I wonder how it would be without them? It looks good though! I can almost smell it baking! We had pecan trees at home and mother often made a similar cake. 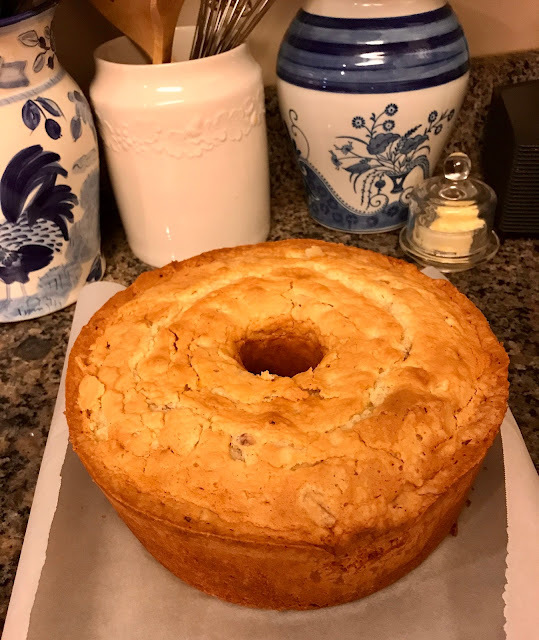 Thank you for sharing the recipe, Arlene--it looks wonderful! !